All schools should be committed to the success of their students. But it's how we go about it that not only makes Northcentral University different from many of its counterparts, but in our opinion, make us better suited to truly serve our students. At NCU, we are dedicated to providing our students with the personal attention they look for when pursuing advanced education. We take a great amount of pride in our programs and the thousands of graduates who have achieved their goals, be it completing their bachelor's degree or successfully defending their dissertation to earn their doctoral degree. At Northcentral University, your classroom size is ONE. In other words, Northcentral's programs provide you with the opportunity to partner with a member of our 100% doctoral faculty in each of your courses. Northcentral University maintains 100% doctoral faculty, most of whom have completed their program of study at a regionally accredited institution of higher education in the discipline in which they teach or develop curricula. Northcentral University is regionally accredited by the WASC Senior College and University Commission (WSCUC). Certain NCU programs have also received programmatic accreditation from other accrediting bodies, including ACBSP and COAMFTE. 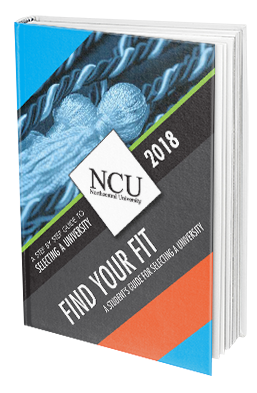 You shouldn't have to put your education on hold, at Northcentral University we offer weekly course starts to fit your schedule. With no need to wait for the start of a semester, you can start your educational journey as soon as you're ready. Northcentral University also has no physical residency requirements, which makes us a great fit for working professionals, as well as for military personnel and international students who do not have to relocate or spend money to travel to a campus to complete the online degree. Need help finding a university? Sign up to receive a step-by-step guide on how to select the right university.